You ever have that kind of say you just need something cute and sparkly and happy in your life? After reading a terribly depressing book for book club, I sure did, and unicorns came to mind. Craftster did not disappoint with the array of unicorn crafts! 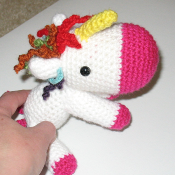 Check out the first example, and adorable, huggable, crocheted unicorn by Lotuspixie. I just want to squeeze the stuffing out of it! 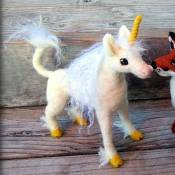 On a smaller scale, this needle felted adorable little unicorn by Nodsu sure hits the mark! I love little needle-felted critters, and this one is just so cute! Check out the post to see the fox, as well! And what cheers you up faster than humor and crafts combined? This very aptly named Unicorn Sh… uh, you get the idea…. 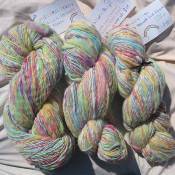 yarn by jexxican really tickles my funny bone while making me drool over its cuteness at the same time. Can you imagine the amazing things you could make out of that yarn? I certainly can! Speaking of funny, you might find it odd that i love both unicorns and zombies, but it’s true. And combining the two? 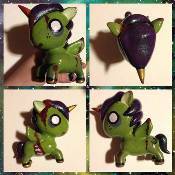 spaceradish gives us this amazing example of a zombie unicorn! If that won’t lift you out of a funk, nothing will! Whatever it takes to brighten your day, from zombies to unicorns to zombie unicorns, Craftster has it all!